Space Mountain. Splash Mountain. Big Thunder Mountain. That’s what most people think of when you mention Walt Disney World. And rightly so, as the four theme parks are the major draw for most visitors. However, there is so much more to do. From playing golf, fishing, riding bikes, and parasailing, to shopping at Disney Springs – the theme parks aren’t the only game in town. However, you don’t need to pack every waking moment with activities. When people ask me for advice about planning a vacation at Walt Disney World, I suggest that they add a day, if possible, and use that day in the middle of their trip to just relax. Yes – relax. Where? One obvious place is at their Disney Vacation Club (DVC) resort. 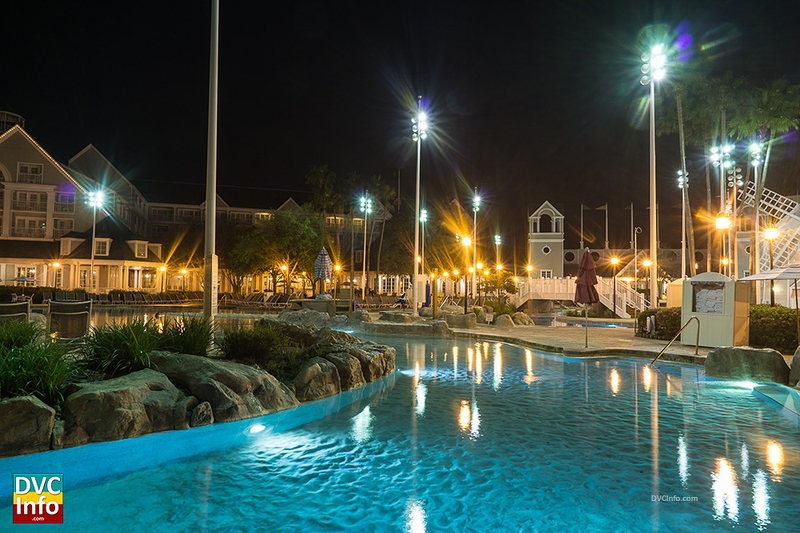 All the DVC resorts feature recreational amenities – including the option of just sitting around the pool. I see so many families rushing around trying to ensure that they don’t waste a minute anywhere else but in the theme parks. Sure, that can be a blast, but it can also be exhausting. I’ve been to Walt Disney World so many times that I’ve had the luxury of spending time away from the parks, and I discovered something. 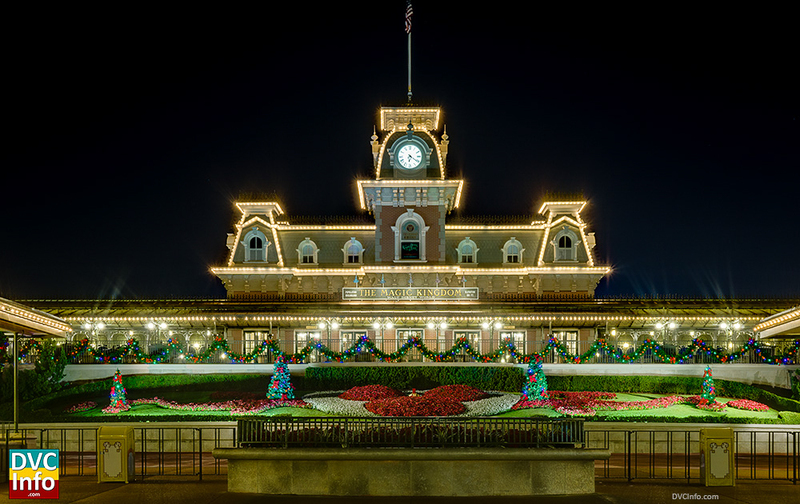 I realized that I, like most people, didn’t recognize the beauty of the Walt Disney World Resort. I discovered how relaxing it was to take the time to experience the beauty of a calm early morning at a resort. And to top it off, it doesn’t cost anything! Since I’m an amateur photographer, I enjoy taking photographs during my vacation – like many people do. However, I have found that my favorite time and place to take photographs is the early morning at a DVC resort. When I say early morning, I mean early morning – well before the early rising guests who want to see the rope drop at the Magic Kingdom. While most guests are still sound asleep in their rooms, I’m out in the twilight, waiting for the start of sunrise. It’s amazingly calm, peaceful and serene. As twilight turns to sunrise, I start taking photos. I’d like to share just a few, so you can get an idea of the beauty of Walt Disney World during one of my favorite times. One of my favorite spots when I stay at Bay Lake Tower is behind the Contemporary Resort, looking out at Bay Lake. This first shot shows twilight changing to sunrise. I love how calm the water is. This second shot shows the start of sunrise. 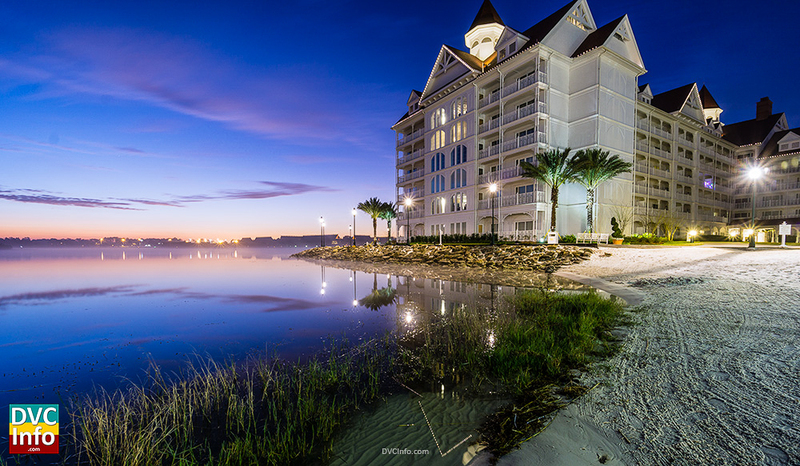 When I stay at the BoardWalk Villas or the Beach Club Villas, I enjoy taking a stroll around Crescent Lake. 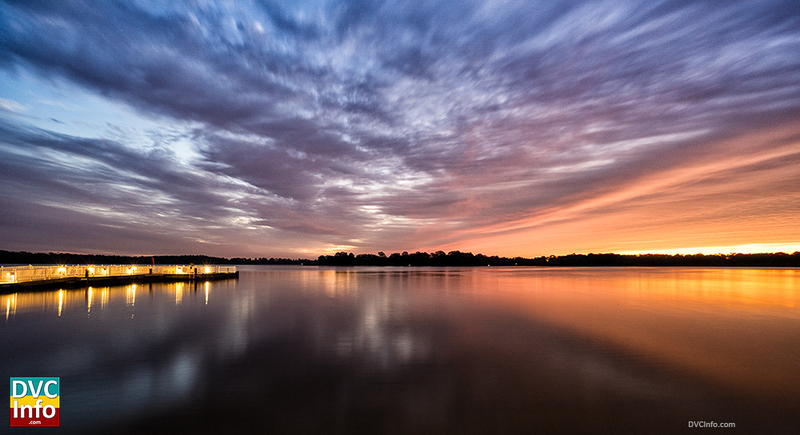 Here is a photo of the lake looking toward the lighthouse. And Beach Club Villas is famous for Stormalong Bay. It sure looks different in the early morning with the glassy water. The Villas at the Grand Floridian resort is probably our favorite DVC resort. And the new Polynesian Villas and Bungalows is also lovely. Here are a couple photos of the bungalows in the Seven Seas lagoon. The first one looks back towards the Contemporary resort. While the second one has the Villas at the Grand Floridian in the background. Everything looks strangely serene in the early morning. For example, even this bus stop at the Magic Kingdom. Image what it will look like later in the day! 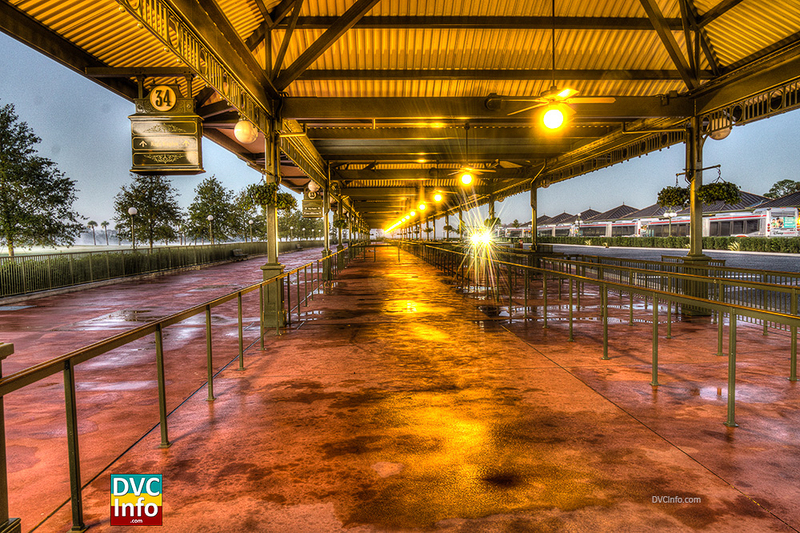 Finally, for you theme park commandos, here is the Magic Kingdom in the early morning before twilight. I hope I shared enough photos for you to get the general idea. 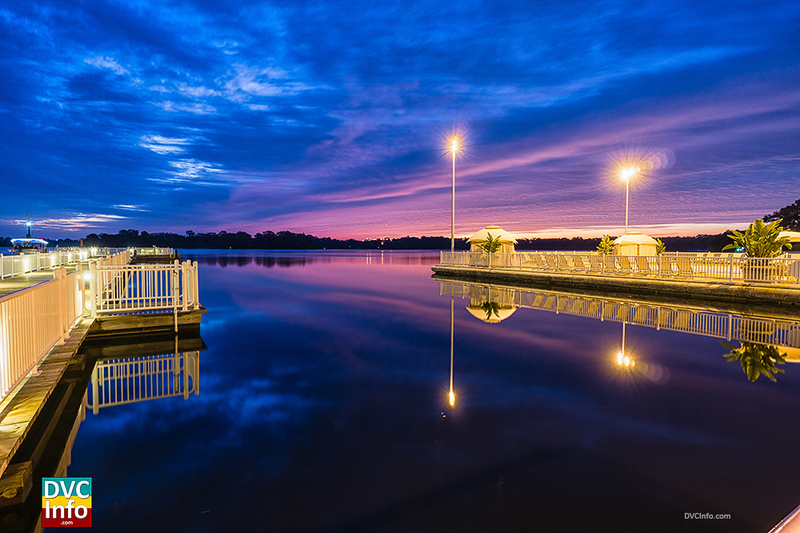 The next time you’re scheduling a vacation at Walt Disney World – schedule some relaxation time, maybe even at sunrise like me! 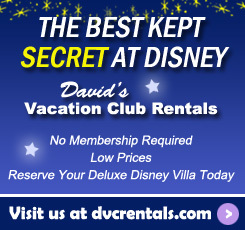 Mike Prewitt has been a DVC Member since 2007 and a very frequent visitor to Walt Disney World. 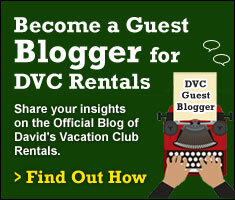 Besides being an amateur photographer, he also runs the DVCInfo.com web site which provides a wealth of information about the Disney vacation clubs, including the DVC Boards at DVCInfo.com, which is a discussion forum dedicated to DVC.